TSPSC TRT SGT 1:3 Selection Lists download at tspsc.gov.in/TSPSC TRT SA 1:3 Selection Lists download at tspsc.gov.in/TSPSC TRT SGT, SA 1:3 Call for Selection List for the post of SGT, SA Selection Lists download at tspsc.gov.in/TSPSC TRT SGT,SA, LPT, PET, PD Results Ranking SGT 1:3 Call for list at TSPSC website tspsc.gov.in Telangana TRT Results, TS TRT Results: Telangana State Teacher Recruitment Test, TS TRT SGT 2018 1:3 Call for list on tspsc.gov.in/TSPSC TRT SGT, SA 1:3 Selection Lists download at tspsc.gov.in. TSPSC TRT SGT,SA, LPT, PET, PD Results Ranking SGT 1:3 Call for list at TSPSC website tspsc.gov.in Telangana TRT Results, TS TRT Results: Telangana State Teacher Recruitment Test, TS TRT SGT 2018 1:3 Call for list on tspsc.gov.in. 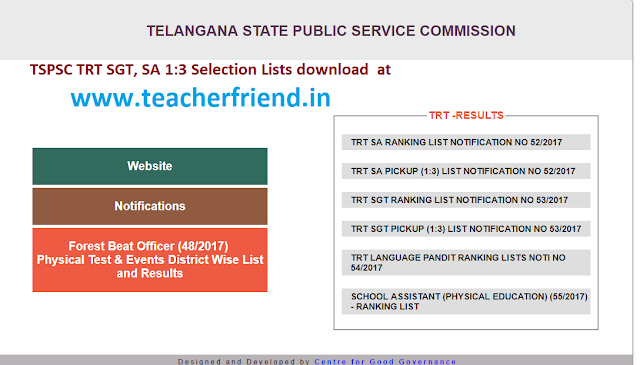 Telangana State Public Service Commission (TSPSC) has released the Telangana Teacher SA, SGT, LPT, PET merit list and cutoff marks today on the official website - tspsc.gov.in. The Telangana State Public Service Commission had conducted the state teacher recruitment test from February 24th to March 4th, 2018. Candidates who appeared for the Telangana TRT recruitment exam can cheeck all details like call letters certificate verification dates and more visit the official website tspsc.gov.in to check their scores online.The candidates who qualify TRT exam 2018 will be recruited in Govt, Mandal Parishad Schools, Zilla Parishad, and Schools Under the control of the Tribal Welfare Department and Municipalities in the Telangana. The selected aspirants will be appointed by the District Selection Committee (DSC) in various schools for the announced posts of SGT, LPT, SA, and PRT posts. It is hereby notified that on the basis of OMR/CBRT Examinations held from 24/02/2018 to 04/03/2018FN&AN to the Post of Secondary Grade Teacher [Telugu, English, Bengali, Hindi,Kannada, Marathi, Urdu & Tamil Mediums]notified vide notification No.53/2017 for a total no. of5415 vacancies in School Education Department the candidates with the following Hall Ticket Numbers are provisionally short listed for Certificate Verification in 1:3 ratio, 13665 candidates are short listed on the basis of Merit and reservations. Set to be filled by the candidate (download from the Commission’s website). Integrated Community certificate (Caste Certificate) issued by T.S. Government with Father/ Mother Name. Disability Certificate (SADAREM Certificate) in case of PH candidates. The PH candidates have to undergo a medical examination at respective Medical Board. Any other relevant document in pursuance of Notification. Certificate verification will be held at the 10 erstwhile District Headquarters The subject Wise, date wise schedule of certificates verification will be intimated shortly. For convenience of the candidates the certificate verification will be conducted at their native districts. Please visit the Commission’s website www.tspsc.gov.in for the further details. SGT 1:3 Selection list Priamble Pickup Notification - Click Here. SGT/SA 1;3 Selection list Click Here.